Capital Reach offers detailed reports on public usage of the webcasts. 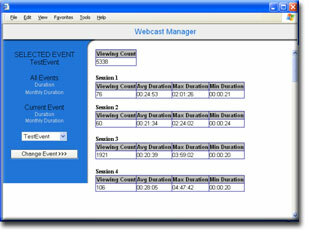 Aggregate and monthly data is provided as well as data on each unique webcast view. The data is available through a secure password protected extranet website and is viewable as HTML or downloadable as Microsoft Excel. Copyright © 2011 Capital Reach LLC. All rights reserved.